Guys... Worgen male. Check it out and thank me later. For those of you who miss this set, or just like it more than the green recolor from the Heroic Troll dungeons in Cat; this set will be coming back in patch 5.2. It will be Uncommon quality items, so be sure to check out quest rewards or the AH, depending on what Blizz wants to make them. This set (aside from the belt) uses the Black variant of the "Zul Aman D1 Leather" set and forms a complete seven-piece set of the art. It should be noted that the only currently-listed helm, Ventaille de Sombrictus, is unavailable now. 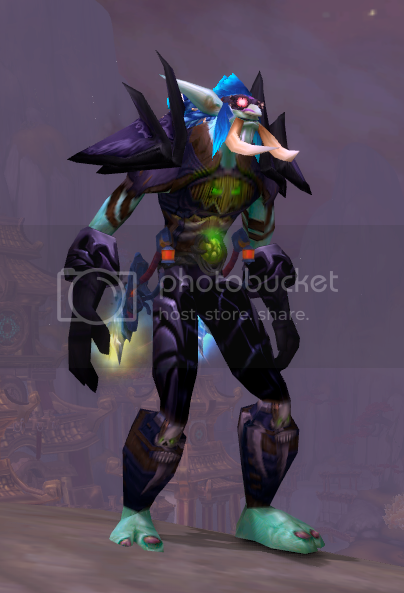 But they added a new helm in patch 5.4: Ventaille usée de Troll crocs-d'ombre. The two listed belts use unrelated artwork. Actually, there isn't any design for a belt in the artwork database, they must have forgotten :( In some sets without waist art they use the top of the pants art to make a belt but they haven't done that here. So pick whatever you like, as there are no pieces designed to match and you may do better than the listed ones. They, unfortunately, did not add in a green version of the helmet for this set in 5.2. They added green versions of every other piece, but for some reason they saw fit to leave out the helmet, leaving this set still incomplete and impossible to finish. A bit disappointing, really. I have this set for my rogue, but I thought I'd pop in and say that I'm using a different belt instead of the set's belt, since the artwork isn't related anyway. I think Archer's Belt looks nicer with this, since it's lime green. The set is mostly dark colors with a little bit of vivid green, and I think it's a nice finishing touch. It does have brighter borders and a little bit of silver, but the entire set isn't one simple thing: It's a lot of dark colors (mainly brown) mixed with bright green, here and there. I just think it adds to it, rather than making it stand out and look weird. But if the set's belt irked you, too, then you might like my suggestion. -- On a non-transmog note, in case you want a quick read, you can farm this set via the Zandalari trolls on Isle of Thunder. Some are located in Za'tual; I did get my Timeworn bracers off one of the first trolls I killed. I say "some" since I'm sure that there will be more trolls to farm in the later progression stages. -- I have gotten mail, plate and cloth Zandalari-themed drops from Isle of Giants, so it's possible that it may drop off mobs in that location as well, but I can't confirm it specifically. For clarification, I've gotten these drops off the Dinomancers and the dinosaurs; not just the humanoids. -- Zandalari themed items also drop in the Throne of Thunder-- LFR included-- though your group may not like it if you roll need on random greens. Ours didn't mind, though; we let the guy take it. But be cautious if you choose to, I've seen people get vote-kicked from rolling on lockboxes or level 87 greens. -- As for weapons, I did get transmog weapons off Isle of Giants. I'm sure it's just pure RNG, but my bags were full of them at one point. This set meshes rather well with the Netherblade set (Rogue T4) and Mantelet de l'étreinte ombreuse. Here's an example (belt is Abandoned Zandalari Silentbelt). In case you are looking for a great replace helmet for the set with a mystic twist, I would suggest you Capuche du souffle de la nature. For daggers I strongly recommend Frappelame abandonnée. ... aaand Tabard trophée des Illidari vert is my personal favorite tabard for the set. Besides the listed greens that drop from Île du Tonnerre, the following items are still obtainable. Perhaps you can save some gold and AH time this way. I did not like the look of the official belt with this set. After a while of searching through other belts still available in-game (since there were very few suggestions in the comments) I found an alternative that I rather like the look of. Ceinturon en tisse-troll The brown matches with the bottom of the chestpiece and it works with the stitched/tribal feel of the set. I've found I actually like this belt better than the "actual" set belt. So that's just another option for those who want something else. I think Masque du sauvage fits well. I didn't see anything in the notes or mined before patch so think it was a sneaky addition. I'd like to add that they can't be farmed on any characters. If you are on your warlock or mage, the wont drop, but the cloth items Epaulières flétries de broyeur d'esprit instead. Since it's personal loot. I'm not sure if it's working like this but I never got any of these when I farmed on my warlock. I received some of the timeworn pieces (the shoulders and gloves) from a big salvaged crate today from the Lv 3 Salvage Yard. Pique du gladiateur orgueilleux fits nice to this set in my opinion. This page merges the black and green versions of this set, which are separate sets. The black version includes all of the Timeworn Shadowtooth pieces as well as Chapardoigts d'entourloupeur, Bottes tabi de Nyn'jah, Thorax en peau de Troll crocs-d'ombre (no longer available to players), and Protège-épaules des lames dansantes (no longer available to players), Chausses de tombe peu profonde, Ventaille de Sombrictus (no longer available to players). The green version includes: Gants barbelés du sage, Torsade du sélénien, Protège-mains de l'agresseur, Protège-mains noués, Brodequins lunaires, Bottillons d'empiètement sauvage, Bottes préservées de Fasc (alternate boot model), Couvrante bénie en élunite, Cuirasse en peau de Troll crocs-d'ombre, Gilet en peau chatoyante (no longer available to players), Habits d'hibernation, Protège-épaules roharts, Jambières imprégnées d'élunite (no longer available to players), Jambières de lames dansantes, Pantalon de superbe récupération, Masque du sauvage. I think the confusion comes from the fact that in TBC, only the black helm/shoulder were available to players, so the closest you could get to a "correct" version of the set was a mix of the black and green sets. But now the entirety of both sets are available to players so they should be properly split apart. This shirt matches the set. I found that Tourment du banni looked good with this set since it matches the glowing fel green eyes and skulls for both shoulders and weapon. I want to ask anyone out there if there's a fel green leather belt that might match this set and if so please post for me and others thank you. Epée griffe-rampante looks incredibly savage with this set. Give it a green glowing enchant and it looks like this sword was made for this set. The belt and wrists actually match the Merciless Gladiator's Leather Armor set. There is no belt that matches this set, just hide your belt. The red and green variants of this set DO have wrists, but it doesn't matter since you can't see them with these gloves anyway.